Hello! Casino UK is an online casino with a great selection of games in many different categories, and it is easy to navigate the website and discover new exciting casino games. This casino is available on both desktops and mobile devices, so you can always use your iOS or Android device when you want to play on the go. Enjoy a secure and reliable casino experience at Hello! Casino, which has gaming licenses from both Curacao and the British Gambling Commission. In this Hello! 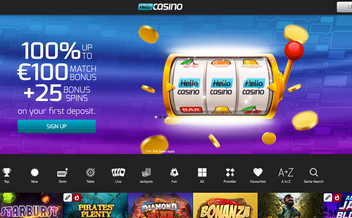 Casino review we will take a look at all the important aspects of the site. Hello! online casino was established 2014 and their selection of games increases every month with exciting new releases from leading game providers like NetEnt, Microgaming, NYX Gaming group, Betsoft, Leander, Thunderkick, Aristocrat and Evolution Gaming. These days you can also put your hands on a Hello! Casino no deposit bonus or two. All casino players appreciate a generous casino bonus and in this section we will take a look at what this casino has to offer. Right now there is a great welcome bonus package available. You do not need to use any Hello! 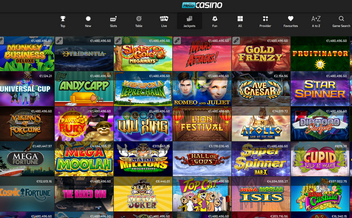 Casino bonus codes to take full advantage of the promotions at are on offer. The welcome bonus offers new players 100% up to £/$/€100 + 25 Extra Spins on Gonzo’s Quest or Twin Spin Delux Slot. Enjoy this offer on your first three deposits. Hello! Casino offers three great deposit bonuses for all new players, as a part of the welcome bonus package described above. Deposits made via Skrill or Neteller are not eligible for the Hello! Casino bonuses, which will give the casino the right to confiscate all winnings. Please also note that unused bonus money or extra spins expire after 30 days, and the wagering requirements have to be fulfilled within that time frame. These bonuses come with a wagering requirement of 35 times the total of bonus money, deposit and extra spins. Hello! Casino offers lots of games from leading software providers like Microgaming, NetEnt, Evolution Gaming, Betsoft, Nyx Interactive, Aristocrat, Leander Games, and Thunderkick. At Hello! Casino they offer over 400 video slots, table games, scratch cards, keno, video poker and more. So no matter what type of game you enjoy the most, chances are high that you will find it there. There is also a live casino with a selection of Roulette, Blackjack and Baccarat. Deposits are available via bank wire transfer, GiroPay, iDEAL, Moneta, Neteller, Paysafecard, Skrill, Visa and WebMoney. When you want to do a Hello! Casino withdrawal you can use bank wire transfer, Neteller, Skrill or Visa. Hello! 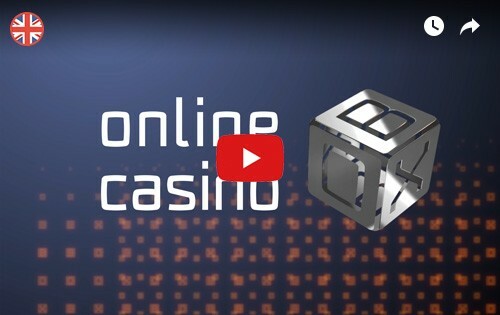 Casino has a withdrawal limit at 2500 per week, and the transaction times vary from 0 hours up to 7 days, depending on how the withdrawal was made. Support is open 24/7 via live chat, which gives immediate solutions. It is also possible to contact the support via e-mail. Players from American Samoa, Northern Mariana Islands, Spain, Turkey, USA, Belgium, France, Guam, Israel, Italy, US Minor Outlying Islands and US Virgin Islands do not have access to the casino. You can play with many different currencies at Hello! Casino, including British pounds sterling, Euros, Swedish kronor, US dollars, Australian dollars, Canadian dollars and South African Rand. This casino is available on all different types of platforms and devices, so when you want to play on the go, we recommend Hello! Casino mobile for optimal experience. There is no need to download an app, because the site has been optimized to function perfectly across all devices. There are more pros than cons with Hello! Casino. One thing that we truly appreciate is that they have three gaming licenses, so it is very secure for British players. Their wide range of top-quality games is also a big plus. The welcome package is a bit limited, but enough for new players to explore the different sections and enjoy some new games for the first time. Hello! Casino is a great and safe casino for British players that are looking for a fresh and modern casino with lots to offer.  Try out their welcome bonus package and explore if it is a great fit for you.